Join us every Tuesday night at the Woking Gaming Club! Interested in knowing in which games I'm working at the moment? Send me a geekmail to discover! Welcome to this week's Amoeba discussion list. If you have found us through a subscription and are wondering where you are, see the links above. Non-trolling comments from non-members are welcome and encouraged, but please leave adding items to the members. I recently bought a new house and hosted my first gaming day. I was the first one hosting a gaming day 4 years ago when I started the Woking Gaming Club, but due to my son being born and my previous house being fairly small, my wife forbade me to host any more. This has now changed and I was overly excited to finally reciprocate all these years of "begging for a gaming host". So this week's Amoeba is about hosting your very own gaming day (and/or night) and if you cannot host, what would you do if you could or had the right conditions? Where do you favour? Do you do it in the living room? Do you have a fully dedicated games room (I wish!)? Do you have to re-arrange furniture in the house? In my case I did it in the dining room because we have there the biggest table of the house and plenty of chairs and it has enough light (natural and artificial). I want to change the light fittings to further improve the lumens. When I have my library fully finished, I might move the table over there as it has wonderful light, my game collection is there and is much nicer than the dining room (real fireplace, bay windows, original wooden floor (from 100 years ago!). The huge mirror might be a problem due to people cheating but I doubt it as we are all true gentlemen. How do you organise the event? How to find a suitable time that accommodates everyone you want to invite? How do you choose the right combination of games? What we usually do is to send a Doodle survey to all invited within a month's notice with many dates covering a month's period. In order to choose the games involved, we used to do a poll on BGG but I have now improved that to a geeklist, which is more dynamic and people can suggest and add games to it and make comments and edit at any point. This is now the new standard. People thumb the games they'd like to play and then on the comments they prioritise or let the rest know of how much they want to play that game (must or meh). A week before the event, we announce which games have been selected and people can read the rules and watch the video tutorials in advance as to avoid wasting precious playing time. But, who should we invite? Maybe you only have 4 or 5 seats available at your place, or you really really want to play a specific game that plays only or best at 4 players. Do you split up into 2 tables or more? Do you avoid the typical AP-prone guys? In my case I could host 2 tables but I would lose the atmosphere. I would want to be with both groups so I rather invite for 1 table. On the other hand, how many? If we are 6, there are not so many great 6-player games that my friends would like to try. How to make the call on whom to invite? Which food and drinks to prepare? Are they allowed at the table or should we break for food and drinks? Do you have an auxiliary table? Buffet style? Do you decorate the house? Do you play music in the background? In my case we have cheese and bread (and butter) of different sorts in a separate place and we take a break for lunch/dinner. Snacks are allowed at the table if they are dry and we do allow for drinks at the table but usually we keep them on the floor or on a side table or window sills. On occasion on the table on coasters. Can you describe the best gaming day you've ever had? What made it so special? What could we learn from it so that we can make our gaming days better? Myrmes saw its second play for me. I still think it is a bit too scripted, particularly at the start (getting extra nurses fast seems a must), but maybe that is simply because I didn't play it enough yet. My Saturday morning group was canceled and I was supposed to work, but I had been up late Friday talking to my female gaming friend (our relationship is not romantic at this point, it needs more dysfunction before we get there) and for unknown reasons got up before 6 AM Saturday and was dragging all day. Recovering from my health issues of the week before (which now appear to be a medication issue) didn't help also had me dragging, so I did nothing productive and even showed up a bit late at the FLGS. That helped me avoid a game of Ultimate Werewolf: Inquisition. I might have enjoyed it, and my mind wasn't there. Instead, I got into a 4 player game of Pax Porfiriana, which was nice because I haven't played it in a while. 2 of us had a lot of experience with the game, 2 were new. The game came down to the 2 experienced players, and the cards broke just right for me to win with a command topple. Which was good, because all my eggs were in the command basket, and the other player would have won if the topple card hadn't come out when it did. Next up was a 5 player game of Colonial: Europe's Empires Overseas. I really like this game, although I get its not for someone, and the last time we played it (with 6, at my place on Labor Day) the game was super enjoyable. I didn't do well in this one, ending with either 4 or 5 prestige, and one of the players didn't like some of the elements of the game, and overall it was a good time. I definitely want to play this more. 4 of us then moved on to Gem Rush, a new new games by Jeremy Lennert, designer of For the Crown, one of my all time favorite games. This is a lighter game, although challenging. Here, you can play co-op or competitively (we played the latter). You start with one tile, then you have to get combinations of gems to open up other rooms. Each of the rooms has a special power. So, it's definitely an efficiency of actions game, and there is a luck element in which gem cards you get (each card except Diamond Dust, which is a wild card), has 2 of the 7 elements on it. The tougher it is to open a room, the more gems are required. You get VPs for opening new rooms. In the co-op version, which I haven't played, you're attempting to get a group total of VP before time runs out. Each turn, though, you burn 2 cards of the 50 cards in the gem deck, so there's 25 turns maximum to the game. It sounds challenging. The game plays 1-6, although in the solo game I guess you'd just play the co-op version. Everyone enjoyed it, and one person may want to buy it. We wrapped up with a partial game of Love Letter using the limited edition set. When the game ended, 2 of us had 2 cubes, 2 had 1 cube...but then the shop closed. No gaming Sunday. We did have a game night earlier this week, which was mostly party games. We started with Pictionary, then went to Tribune: Primus Inter Pares, then back to Taboo and some other games that my brain isn't wrapping around right now. Plus, they were playing a party game when I got there. Good fun. "My name is Ozymandias, king of kings: / Look on my works, ye Mighty, and despair!" Never let the future disturb you. You will meet it, if you have to, with the same weapons of reason which today arm you against the present. Unfortunately, last week was a very light game week for me (in part because I was busy doing last-minute studying for the SAT, but that's another story). I did manage to get in two games though. _8.6_ Commands & Colors: Ancients: I had the Romans at Cannae in this one. After some drawish skirmishing on my right flank, I gained some key kills when the medium and heavy infantry inevitably met in the center. I won the day 7-4. _8.6_ Paths of Glory: First things first: I'm really bad at this game. I love it though. In this particular match, my Allies were doing decently after stabilizing the Western Front and keeping relative peace in Russia. Hopefully I'll be able to finish this game soon; the match soon eclipsed my opponent's bedtime. 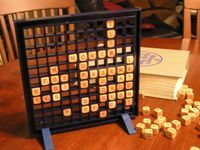 http://www.lautapeliopas.fi/ - the best Finnish board game resource! I last played Stephensons Rocket in 2003, and it left a decent impression. I got a while ago, maybe year or so, in a trade or auction, and it has been waiting for the right moment ever since. Well, that happened last week - and guess what? It wasn't that good. In the end I prefer actual Acquire to this more complicated and confusing version. Qwixx and Las Vegas are the top fillers right now. My son likes Las Vegas, and I think this game should've won the Finnish family game of the year award - it's such a successful little game, as it works as a family game with children, between casual gamer adults and as a filler for enthusiastic gamers. On iPhone, I'm badly addicted to Pocket Trains. Eric, if you have an iPhone, you might want to try this one - it feels quite like Eurorails! You need to build a railroad network and move goods from city to city to gain money. It's kind of tedious as these free-but-pay-for-extras games tend to be, but in a good way. It's also very non-frustrating, and doesn't really push the in-app purchases - it's easy to play without actually paying anything. I'm still not quite sure what to think about Ora et Labora. Kind-of-enjoying-it-but-not-really is an odd state to be in. Ubongo 3D is amusing (and much harder than its 2D brethren), Make'n'Break is too, but the constructions are too easy which means the game is more about grabbing the correct pieces quickly than actually building stuff. The Palaces of Carrara was interesting and the key seems to be all about the pacing of the game. Ideally, you want to drive the pacing and you need to be aware of what others are attempting and how the wheel moves for resources. I felt that I was getting the raw end of the deal with resources most times so I focused on trying to get out of sync with others and end the game quickly. I did so just in time to pull out the victory. We played the advanced game right away. We did score incorrectly, but the placements would still have been the same, just closer. Castle Dice was an enjoyable dice resource game. I'm not certain if I like the market deck which contains quite a few nasty cards whereas the other two decks focus only on your plateau. This dragged on a bit too long, but two of the four players do tend to think longer about their options and this slowed the game pace. I don't think I will run out to buy this one, but I would like to play again. The other three games were played with a friend who dropped by for a couple hours. Mosaix is one I always enjoy, but my friend failed to tell me that he doesn't do well with spatial puzzles so I destroyed him in this one. Typo is one I generally enjoy, but I'm not certain I like this one two player. Harry's Grand Slam Baseball Game is just one of those fun time wasters with very few decisions - but still addicting/fun. Reminds me of some IOS/internet games that really have few decisions, but still is enjoyable. I destroyed him 16-3 in the second game - don't think I've ever seen one person score that many runs. I was down at my parents' house for my brother's birthday this weekend. Both of these games were with me, Anni, Jon, and Lauren. _6_ Space Cadets - We decided to play the first scenario again, since our last attempt ended in an epic fail. I was the shields/sensors person, while Anni was the captain/engineering/tractor, Jon was helm and jump, and Lauren was weapons and repair. We managed to snag the first crystal without too much difficulty, but the enemy ships started getting to us when we approached the second. An early damage card revealed a switch roles, so Lauren and I ended up switching. This wasn't great, as Lauren wasn't great at shields, and I ended up being fairly incompetent at weapons. At one point, Anni gave me one point of weapons, and after some debate, decided to give me a second point--however, I quickly forgot about it and declared myself done after completing the first puzzle. Oops! We destroyed one of the ships guarding the second crystal, and then took off toward the third. Jon was pretty confident in jumping, so we needed to just dash in and jump out. We tried to do just that, but Anni messed up on the tractor, and we got pounded from three ships at once, with the Nemesis swiftly approaching. Fortunately, we were able to deal with the damage for one turn, picked up the crystal, and jumped out before taking another turn's worth of beatings. 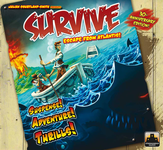 _7_ Survive: Escape from Atlantis! - I actually gave this game to my brother as his birthday present, so we played shortly afterward. In setting up, I had this brilliant idea to place my pawns in a random order, so that other people wouldn't figure out where my valuable pawns were. This was a terrible idea! By the time I drew my more valuable pawns, the good spots were all taken, so I had to put them in more exposed spots. I remembered where my 3 most valuable pawns were (and forgot the others), and focused on trying to get them to safety. I got my 4 and my 5 to safety early, but my 6 missed the boat, unfortunately. I got a brief reprieve when someone took a tile next to him and a boat magically appeared. He jumped on the boat, was immediately attacked by a whale, but I just a tile to fight off the whale. Of course, next turn he was attacked by another whale, so he ended up in the water, where he was attacked by a shark, but I fended him off with another tile. And then the game ended. Lauren won by a large margin, but putting all her pawns in the same boats, and then using a tile to send the Sea Serpent guarding that corner far away. Jon got most of his valuable pawns destroyed by a whirlpool, so I ended up coming in third. This image is not mine – message me if you know who made it! 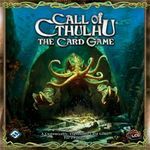 I finally put together a Call of Cthulhu cube (one copy of each card – with some editing) and got my buddy Nico to play. What a fantastic format for this game! We each grabbed a stack of 50 cards and started playing, without looking through our decks at all. I feel like this is the way the game is meant to be played (never mind the various Shub characters that mention duplicates). Now I'm working on getting other people to give the game a shot so we can do a draft... we shall see. Hanabi is a very sweet game, and it's a perfect response to the most common weakness of co-op games, since every player has to make important decisions on their own. I can see how it would get monotonous once optimal play was determined, but we're nowhere near that point, so I'm eager to play some more yet. My favorite 18xx game for six players is two games of 1846 with three players each. _7_ String Safari -- This is a remarkably cute game using a mechanism similar to the one used in their earlier String Railway. It works better here, in my opinion. Players are cast as zoology researchers, learning about animals and publishing papers about some of the ones they observe (at least, that's my interpretation of the thematic background behind the mechanism.) There's plenty of luck, but there are decisions to make, and it's a clean, streamlined game. I then played three games last night. We milled around picking a set of games for 9 people to play, and I decided to pull a game out and simplify things. Marsha and Joe joined me. _8_ Merchant of Venus -- This is an example of a classic game that still works. I had stone cold dice, rolling 8 or less repeatedly with a 4-die Clipper. Joe got Jump Start, a huge find given the fact that we found 5 jump gates well positioned on the board, but he had a lot of trouble rolling the pilot numbers he needed for much of the game. Marsha got Mulligan gear but also rolled better than Joe or I. It actually seemed competitive for a while until Joe stopped rolling horrid dice and finished it off. Marsha was close with over $1700 and I was well back. We finished a game to $2000 in no more than 60 minutes. _7_ Hammer of the Scots -- I own this game and am sure I've played it, but I've been recording all my plays since 1/1/2002 and had never recorded a play, so I'm not sure what's up, because the publication date is shown as 2002. Anyway, the numbers worked out in such a way that it seemed helpful for Joe and me to play a 2-player game, and we chose this one. I was the Scot and Joe the English. It was a game with some swings. I had early success, getting to 8 nobles in 2 turns to add the French block, but 2 turns later he killed Wallace and the Vikings to swing things his way. I in turn managed to surround and kill a big English force, and he was way out of position (it's not easy to march an English army back up from England if you get wiped out up north.) He resigned a little before the end. _6_ Old Town -- This is a clever game I had never played. Joe has the 2002 version, which he claims is best. It's a game in which you play a historian trying to figure out which buildings were where in a long dead western town. You play various evidence cards and get points for possibilities you eliminate.